Tango’s Subs and Empanadas opened in October 2006 in Boise, Idaho. 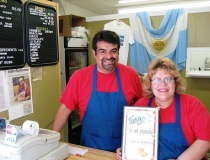 Since then we have had the pleasure of introducing empanadas from Argentina to Idaho. We take pride in our EMPANADAS ( EM – PAH – NAH – DAS). Because we are a Mom and Pop establishment we cook for you as if it was for our family. Only the best ingredients and with love! Check our menu and find your empanada! We sell yerba mate, gourds and bombillas along with other imported Argentinian products. You will always be treated as such and we love to see you leave with a smile and know we have made yet one more friend. You can dine in or take out, our phone number is (208)322-3090. We now offer lunch boxes for business meetings or your special needs.